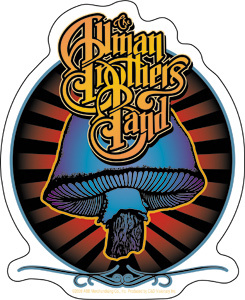 This sticker decal features The Allman Brothers Band logo over a prominent shroom on a burst of rays background. The approximate size of the sticker is 4" x 5". Officially licensed Allman Brothers Band merchandise. Put it anywhere that you want to show your Brothers pride!